Renewable portfolio standards: More than half of states across the nation have implemented mandatory renewable portfolio standards that require utilities to acquire a certain percentage of their power from renewable sources. Carbon pricing policies: Even though the United States has not yet implemented a nation-wide process for pricing carbon, some steps toward such a system have been made in the past decade, such as regional CO2 markets like the Regional Greenhouse Gas Initiative and the California Global Warming Solutions Act. Utilities anticipate such programs becoming ubiquitous in the future and, as such, are working to decarbonize their generation mix in advance. More aggressive strategies: Beyond that, some states are implementing policies that more aggressively push the electricity sector towards renewable energy, such as California recently becoming the first state to require new homes to be built with rooftop solar. Each of these policies shares the goal of staving off climate change by reducing CO2 emissions in the energy sector while also ensuring the delivery of sufficient reliable and affordable power. However, several unintended consequences, both good and bad, have either been demonstrated or are anticipated in advance of further decarbonization of the energy sector. The National Renewable Energy Laboratory (NREL) studied the impact that a 35% penetration of solar and wind power would have on the grid of the western United States specifically and found that operating costs would drop by up to $50 billion per year in the energy sector (which would represent up to 40% of total operating costs) due to reduced fuel costs and savings from potential carbon pricing (using a hypothetical $30 per metric ton CO2 pricing). In addition to cost savings, NREL’s study results, if realized, would successfully reduce hundreds of millions of tons of CO2 per year (along with other air pollutants like sulfur dioxide and nitrogen dioxide). In certain areas of the country, such as California, electricity generation already exceeds demand during some daytime hours in months when electricity demand is relatively low, such as early spring before air conditioning is needed. In those hours, the overabundance of solar power can lead to curtailments of some of the solar generation. This problem is exacerbated at sunset, which requires the existing dispatchable plants to ramp up quickly to meet load later in the day. This phenomenon, known as the “duck curve”, was described in a previous OnLocation blog post. Electricity diurnal storage technologies such as lithium ion batteries can help shift some of this generation from daytime hours to later in the day, however storage costs are still relatively expensive (but declining). Additionally, because the current grid was built without such storage, the balance between supply and demand is delicate and precarious—not enough power means rolling blackouts, while too much power means inefficient and costly curtailment of perfectly good energy resources. The presence of increased solar and wind resources requires utilities to have often inefficient reserve capacity such as gas turbines that can be deployed at a moment’s notice to ensure the grid stays balanced. Lastly, an increased penetration of renewable energy tends to drive down the wholesale energy prices overall because of the low costs for renewable generation. While that at first glance seems like a great result, the low-cost competition from renewables means that dispatchable energy sources like coal, natural gas, and nuclear need to be sold at a lower price to compete which is uneconomical in the long term and often leads to plants closing. Such a trend is an issue because renewable generation cannot be counted on every hour of the day (sometimes the sun doesn’t shine and the wind doesn’t blow), and electricity storage technology is not yet affordable enough to where the grid can rely 100% on renewable sources. In those times when renewables are unavailable, that’s when the baseload generation of dispatchable energy sources is needed, but those sources are at risk because of the low-cost competition from renewables. 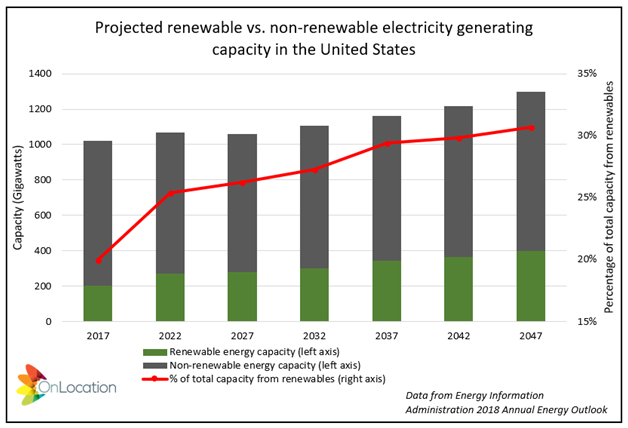 Despite the good and the bad already known about the decarbonization of the grid, much remains uncertain ahead of the continued shift towards greater renewable energy penetration. For one, the environmental benefits of CO2 reductions associated with renewable energy are a known positive, but some of the accommodations needed to make this shift (e.g., energy storage, new transmission capacity, reserve capacity) come with their own environmental costs. While studies show that the CO2 benefits likely outweigh these other costs, the relative magnitude of each side of the coin is uncertain and could affect how quickly the market should be shifting toward renewables. Further, some important aspects of the future electric grid, such as the penetration of electric vehicles in the nation’s fleet and demand-side management practices such as smart appliances, come with great uncertainty. How those products play out will greatly impact the underlying needs and abilities of the nation’s electrical grid, especially as it relates to how renewable energy sources could fit into the equation in an increasingly decarbonized grid. With so much uncertainty in the energy sector, it truly is impossible to know all the secondary benefits or unintended consequences that decarbonization of the grid will have. However, keeping up with the evolving market trends, progressively advancing technologies, and evolving public policies will leave you best positioned to know how to respond. To learn about how OnLocation can help you explore issues related to energy and anticipated changes in the electricity generation markets, visit http://www.onlocationinc.com/contact-us or contact us at contact@onlocationinc.com.